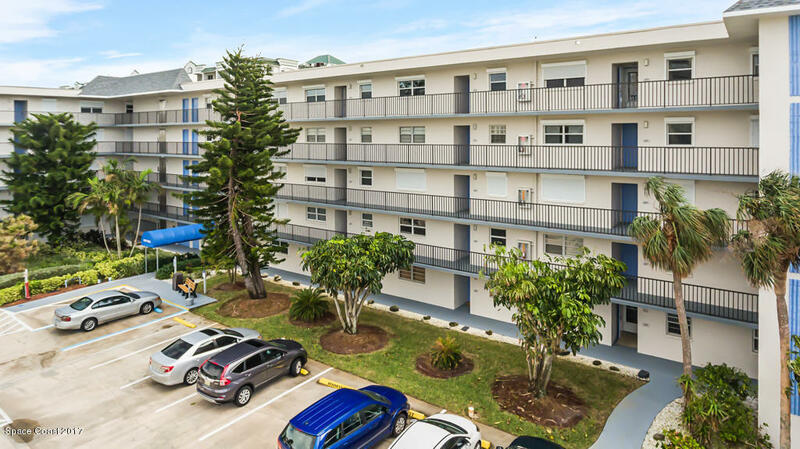 Spacious, well-maintained 2/2 condo with private beach access in the desirable beachside community of Port Royal. NEW laminate wood floors and tile. No carpet! Newer stainless-steel kitchen appliances. Storm shutters, AC, and water heater installed 2014. Bright and open split bedroom plan provides ample privacy. Spacious tiled patio with storm shutters. Resort style community includes private beach access, heated pool, tennis courts, car wash area & clubhouse. Ample parking. Pet friendly community. Beach crossover with endless miles of pristine beaches to explore. This beautiful residence is centrally located in Cocoa Beach with access to shops, medical centers, restaurants, & grocers. Come experience the beach island lifestyle!